She is one of the UK's most loved gardening experts, solving the nations gardening problems every week on BBC Radio 4's Gardener's Question Time, writing articles and blogs for Gardener's World, whilst also running a fantastic web site that has just been updated with a brand new shop section. The items included for sale on her web site are all essential items, hand picked by Pippa.So if you're curious to know which Haxnicks products meet her seal of approval, click on the link/picture and take a look! This entry was posted in News & Events and tagged Pippa Greenwood on 2nd December, 2011 by Haxnicks. This year's Glee was a real triumph for us. We managed to see most of our customers and they were all very complimentary on our new products, especially the Unidomes, which we are currently taking bespoke orders for. Three domes were on display around the exhibition, as well as our victorian bells and other garden care products in the 'Off the Shelf' display. All in all a very positive show - see you all next year! Any general enquiries should go through our sales office [email protected] or 0845 241 1555 where Emily, Ali or Danielle will be very happy to speak to you. This entry was posted in News & Events and tagged GLEE on 14th September, 2011 by Haxnicks. 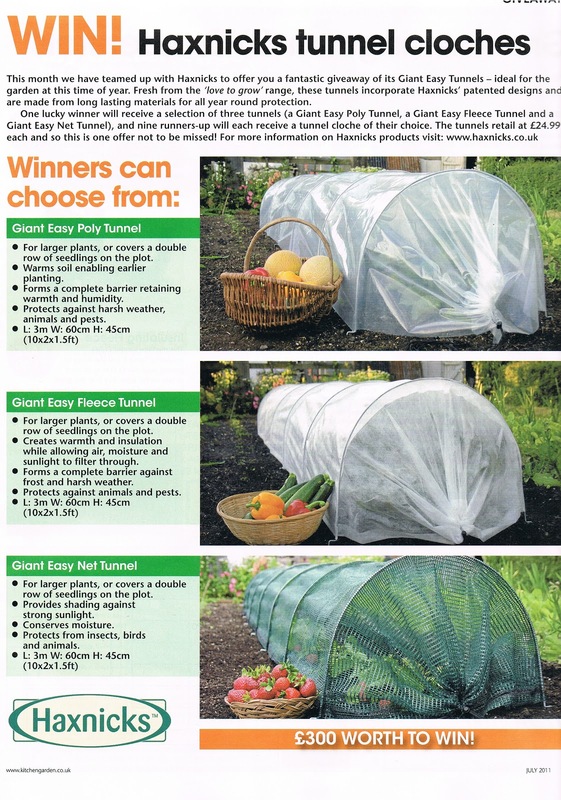 The July issue of Kitchen Garden Magazine contains a fantastic competition to win £75 worth of Giant Easy Tunnels! This entry was posted in News & Events and tagged competition on 14th June, 2011 by Haxnicks. 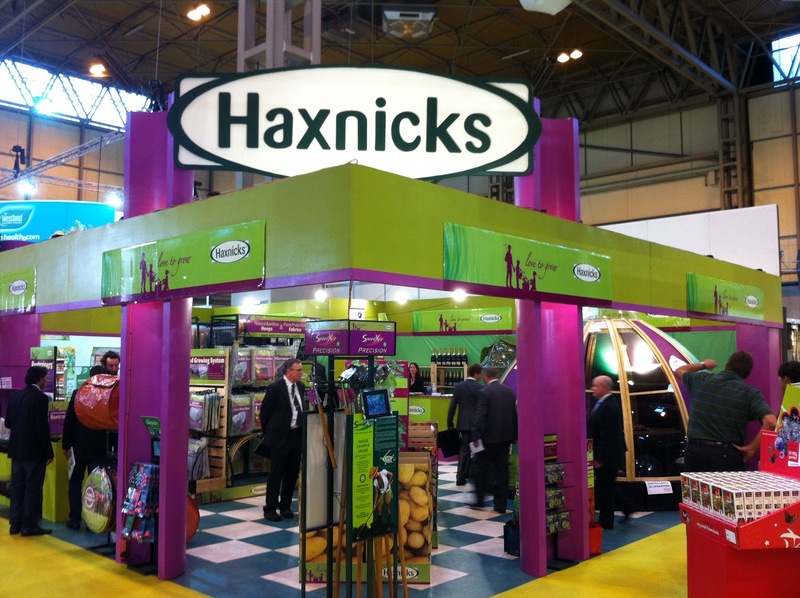 Kim Aldred (Assistant to the Sales Director) will be running the Haxnicks stand again this year, and would like to welcome all of the visitors to her favourite spring event. 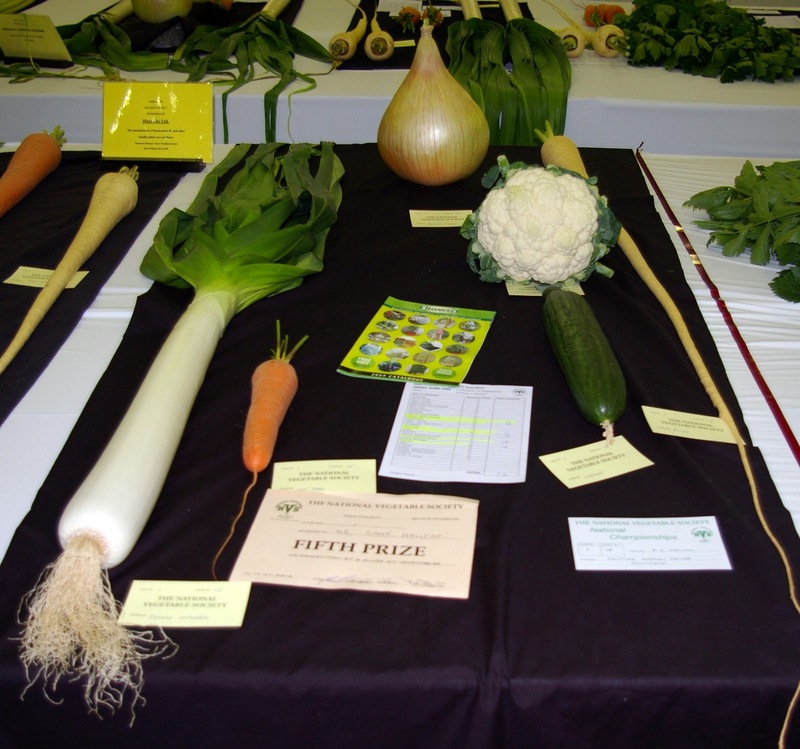 "Malvern is such a great show - you get to meet so many gardening enthusiasts, young and old - and there are also loads of bargains to be had. I love it!" Kim and her team are on hand to answer any questions you may have about Haxnicks products and competitions. They can be found at stand number 514 at The Malvern Spring Show from 12th - 15th May. This entry was posted in News & Events on 12th May, 2011 by Haxnicks. Spending the day at Lakeside in Warminster was invaluable to me and hopefully for some of the customers I spoke to. The day started fairly slowly, but by the end I had a non-stop flow of families stopping by my Potato Patio Planter demonstration and asking all kinds of questions!Luckily, Champion Grower, RHS Gold Medallist and past Gardener's World presenter Dave 'Taffy Tatties' Chappell was on hand to help! Mr Chappell about to be showered in praise and/or compost from Robbie's Planter! Mr Chappell is quite a character as some of you will know. He travels the width and breadth of the country giving talks about growing and showing spuds, whilst entertaining everyone with his awful jokes. I can say this as I know he won't be reading our blog, preferring the written letter to 'anti-social nit-twerping'! So please, no one tell him! If you would like to visit Lakeside Garden Centre (they do a cracking bacon and brie panini) you'll find them on the A350 just outside of Crockerton near Warminster in Wiltshire. Call on 01985 217 413 for more information. If you would like to contact Dave Chappell and perhaps invite him to your garden centre, school or gardening club you can call him on 01291 420 048. Or why not write to him : Mr D Chappell, Taffy Tattie, 42 Caldicot Road, Rogiet NP26 3SE. I don't think he has a Facebook page or Twitter account though! This entry was posted in News & Events on 29th March, 2011 by Haxnicks. Following the recent features in the 20th Anniversary Edition of Gardener's World Magazine we thought we'd let you know a bit more about the various articles that feature Haxnicks products. Helen Riches is a garden designer that regularly contributes to Gardener's World magazine and has won awards for her garden writing in the past. In this edition she chose to use our Victorian Bell Cloche in 'Summer Pots from Seed' and shows readers not only how to grow flowers for some real summer colour, but also how to do it on a Budget. We're reproducing the article in full below, but you can find out much more on Helen Riches' website. Haxnicks Victorian Bell Cloches are the original plastic cloche, based on the old fashioned glass type, and having sold well over a million, Haxnicks continue to be the leading manufacturer of these award winning cloches. Versatile, practical, reusable and stackable the Victorian Cloche is a favourite for many modern gardening experts. If you're looking to buy some (or want to see them for real) try our Stockist section. We list all current stockists and if your local garden centre doesn't have them you can also buy online. As always - it's your feedback that counts... please feel free to tell us what you think of our Victorian Bell Cloches. This entry was posted in News & Events and tagged Large Victorian Bell, Original Victorian Bells, Baby Victorian Bells on 3rd March, 2011 by Haxnicks. We're very proud to note that Haxnicks products have received some fabulous coverage in the 20th Anniversary Edition of Gardener's World magazine. What we want to know is - what do you think? 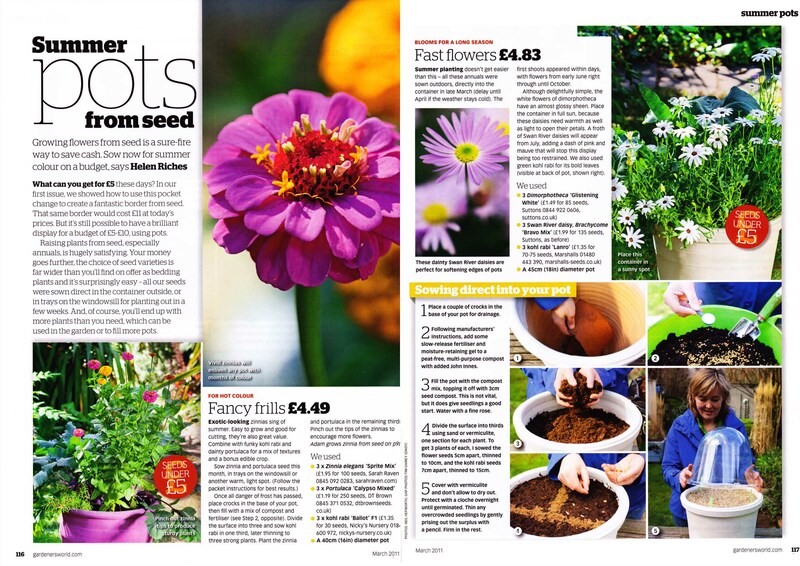 Helen Riches, Lila Das Gupta and long term friend of Haxnicks Pippa Greenwood can all be seen in the BBC's foremost gardening publication using Haxnicks products. Helen Riches, award winning garden writer and garden designer, recommended covering with a cloche overnight to give germinating seeds a better chance in her article entitled 'Summer Pots from Seed'. Lila Das Gupta also wrote an article about sowing Runner Beans and the benefits of using Rootrainers. Pippa Greenwood meanwhile chose to recommend our Kitchen Garden Cloche for her article on protecting small groups of fruit and vegetables in their early stages and to extend their growing season. And scattered throughout as always, our Biodegradable Pots Naturally range. What can we say? Well, go out and buy Gardeners World Magazine and see for yourselves of course! And here for your added info is a list of links to Gardeners World Articles and Blogs - enjoy! Now we want to hear from you... what did you think, have you seen our products in any magazines or TV shows? Look out for us, we have great links with gardening experts across England and Scotland and even Ireland. But don't forget we're a company that wants to produce the best quality garden care products we can and that means listening to your feedback. Please leave us a comment. This entry was posted in News & Events and tagged Large Victorian Bell, Compact Rapid Rootrainers, Original Victorian Bells, Kitchen Garden Cloche, Deep (Sherwood) Rootrainers, 5in Pots Naturally, 6in Pots Naturally, Baby Victorian Bells on 24th February, 2011 by Haxnicks. 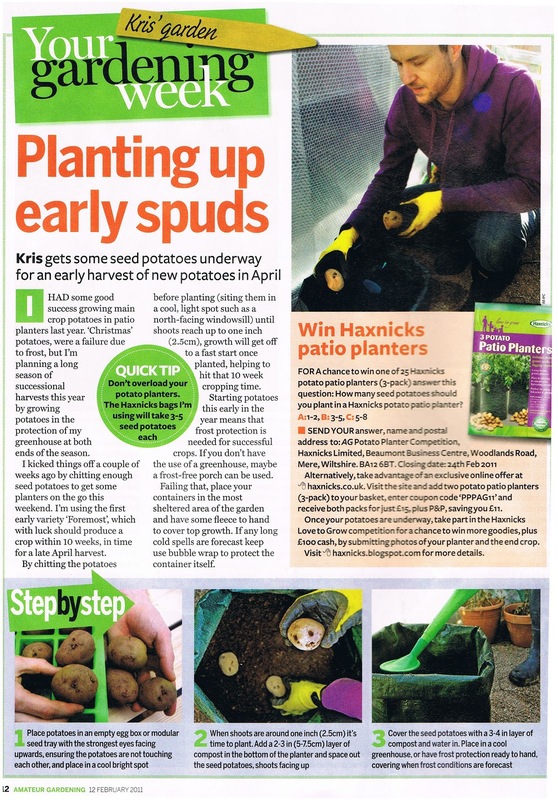 This entry was posted in News & Events and tagged Potato Patio Planters, competition on 10th February, 2011 by Haxnicks. We are very proud to announce that our own Compact Rapid Rootrainers have been awarded 'Best Buy' awards in not one but two weekly gardening magazines, Garden News and Amateur Gardening. 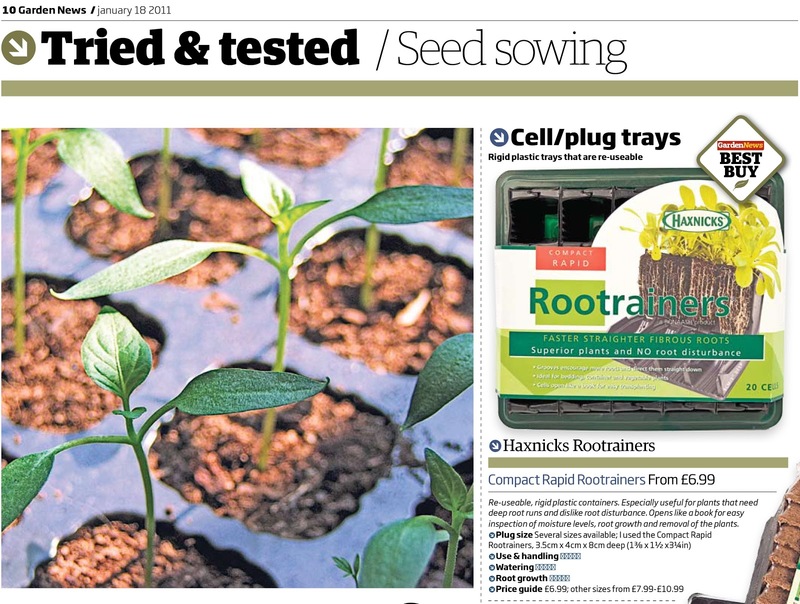 Garden News chose our Rootrainers because they were "Re-useable, rigid plastic containers. Especially useful for plants that need deep root runs and dislike root disturbance." Geoff Hodge, gardening expert and tried and tested journalist for the weekly publication awarded it 5 out of 5 for Use & handling, Watering, and Root growth. "Opens like a book for easy inspection of moisture levels, root growth and removal of the plants...my Best Buy went to Rootrainers as they are re-useable." Compact Rapid Rootrainers come with a drip tray, propagating lid and have 20 cells in total. To top it all off they are made in Great Britain, and as well as being re-usable, with a lifespan of approximately 6 years, they are also manufactured from recycled plastic. "The shape and grooves promote optimum root formation. Good way to raise bedding or cuttings as it makes handling the plants simpler. 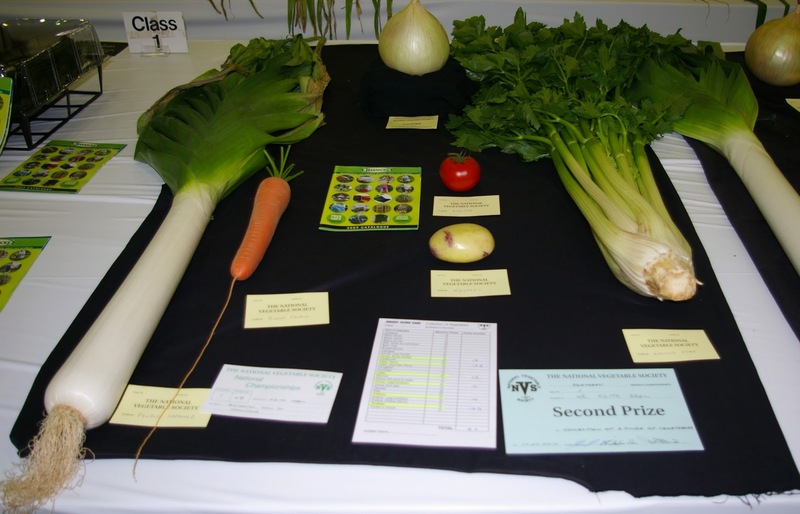 Those produced should be bigger and garden ready due to the larger root system." So why not see if the experts are right - try out our Compact Rapid Rootrainers and see for yourselves (quite literally) the quality of plant you can produce. Available as a deluxe version with a handy drip tray, perfect for windowsills. 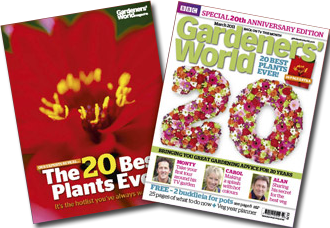 Amateur Gardening and Garden News are both priced £1.99 and available from newsagents and supermarkets every Tuesday. This entry was posted in News & Events and tagged Compact Rapid Rootrainers, Deep (Sherwood) Rootrainers, Rapid (Shrub) Rootrainers, Compact Rapid Rootrainers with Drip Tray on 26th January, 2011 by Haxnicks. 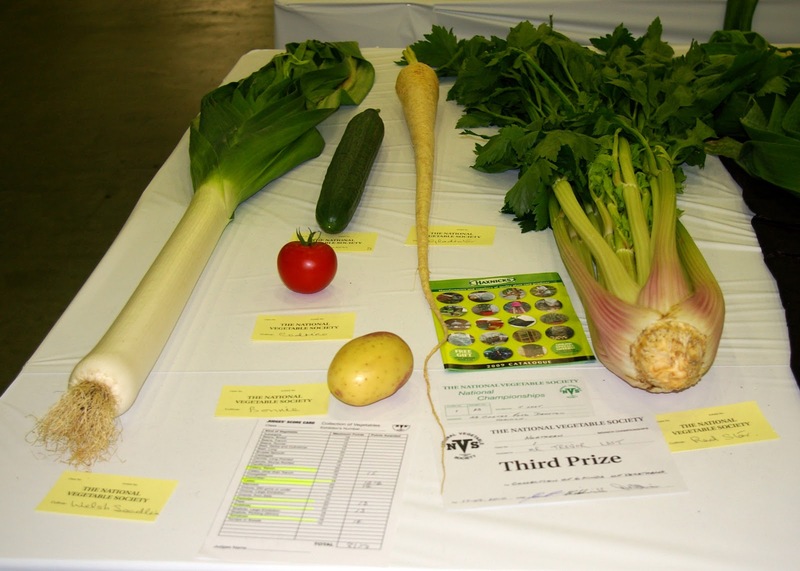 Haxnicks sponsored Class 1 of The Northern Branch of the National Vegetable Society's Championships this year. 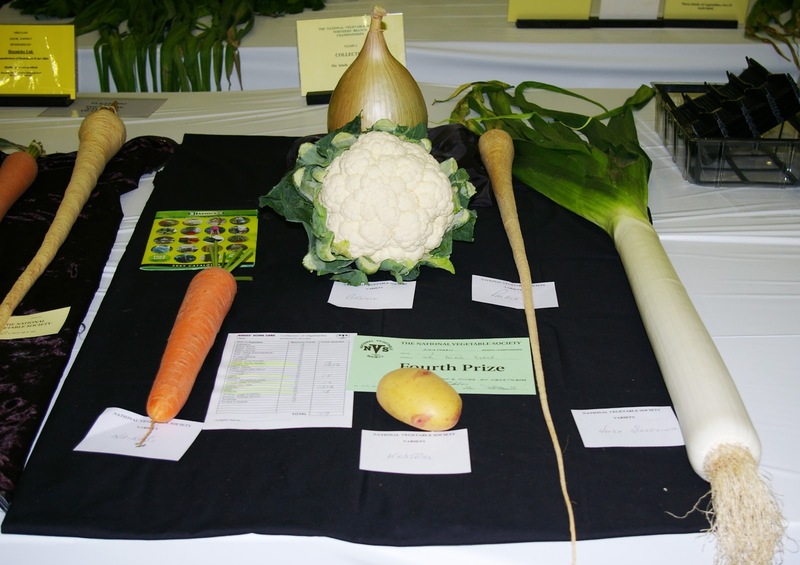 To exhibit in this class, each exhibitor could display one vegetable of each kind. The winner was Peter Clark, who was also awarded the 'Cockney Bowl' (wonder if he celebrated by doing the 'lambeth walk'?) for gaining the most points in the Championship classes - congratulations, Peter! 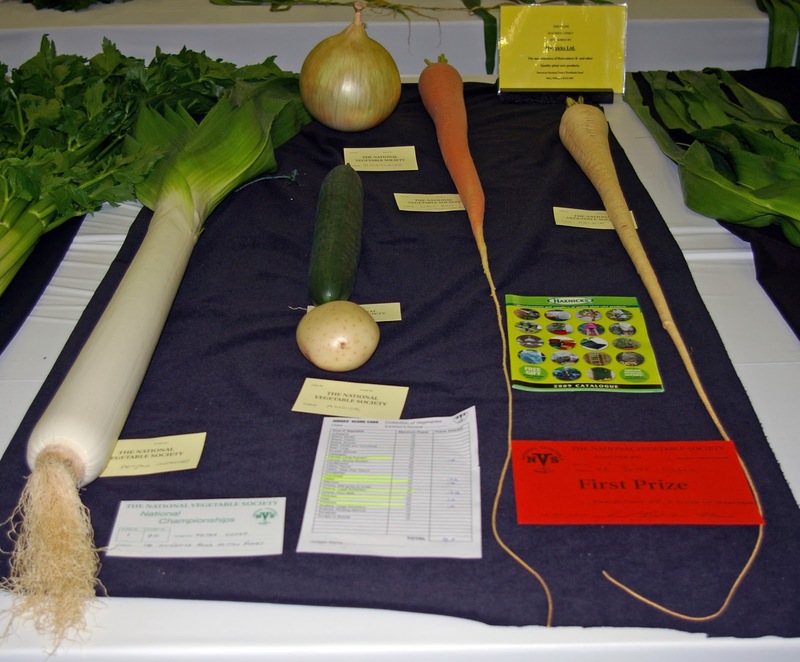 His winning combination in Haxnicks' Class 1: Onion Dave Metcalfe strain, Cucumber Carman, Potato NVS Amour, Parsnip Palace, Leek Pendle Improved and Long Carrot New Red Intermediate. This entry was posted in News & Events on 6th October, 2010 by Haxnicks.